Credit: Nobuyuki Zettsu Ph.D., the Center for Energy and Environmental Science, the Department of Materials Chemistry, Shinshu University, Japan. A team of researchers from Shinshu University in Nagano, Japan is now closer to a thin, high-capacity lithium-ion battery that could open the gates to better energy storage systems for electric vehicles. The research team was led by professor Katsuya Teshima, director of the Center for Energy and Environmental Science (hereinafter called CEES) at Shinshu University in Japan. They published their insights online in August in Scientific Reports. "Lithium-ion batteries are very promising energy storage systems for electric vehicles that require relatively high energy densities," said the study's author Nobuyuki Zettsu, a professor in the CEES and in the Department of Materials Chemistry at Shinshu University. "However, their high operating voltages commonly result in the oxidative decomposition of the electrode surface, which subsequently promotes various side reactions." Lithium-ion batteries store a lot of energy, but the force it takes to make the battery disperse the energy is too much – so much, in fact, that the resulting damage makes the battery lose storage capacity. To combat this issue, Zettsu and colleagues examined the electric and electrochemical properties of the high-voltage (>4.8 V, vs Li+/Li) cathode, where the electrons enter the battery cell. "Many researchers have attempted to mitigate the observed capacity fading through the reduction of the direct contact area," Zettsu said, pointing to research projects where scientists covered the surface of the cathode with different materials in an attempt to reduce erosion. "Various fundamental studies have been performed to investigate the effects of the surface coating modification; however, none of them led to a considerable performance enhancement of high-voltage cathode-based battery cells." Zettsu may have turned the tide on surface modifiers through the use of a self-assembled monolayer. His team applied an ultra-thin coating of fluoroalkylisilane to the surface of the cathodes. Fluoroalkylisilane, a type of silicone, organizes itself into the most efficient arrangement to conduct lithium ions and insulate electrons while remaining only one atom thick. "We discovered… that coating the surface of the active material with a self-assembled monolayer… promoted efficient transportation within the electrodes, while also suppressing the side reactions occurring at the electrode and electrolyte interface," Zettsu said. "This coating provided improvement in both the power density and the cyclability in high-voltage lithium-ion batteries." The researchers saw that the direct contact between the cathode and the electrolyte entering the battery was minimized, and that the capacity of the battery did not degrade even after it was cycled one hundred times. 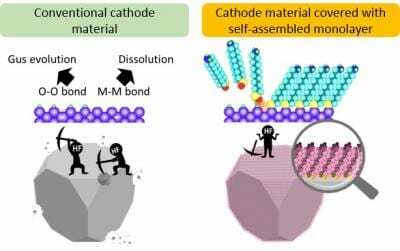 "The deposited self-assembled monolayer coatings reduced the activation barrier for the lithium ion transfer and stabilized ions near the surface, which positively affected the electrochemical reactions occurring at the interface between the electrode and electrolyte," Zettsu said. "The surface stabilization coatings represent a game-changing technology for the development of high-voltage cathode materials without the limitation of the electrochemical dilemma of efficiency versus stabilization." However, Zettsu said, the full effects produced by the surface coating on the full battery system need to be examined in greater detail to better understand any potential negative side-effects. "Our results can provide new directions for designing lithium-ion batteries based on high-voltage systems with superior electrochemical performance," Zettsu said. Zettsu plans to introduce this surface treatment technology to the market by 2022 in cooperation with automobile and cell manufacturers, with the aim of creating high-energy batteries that are also environmentally friendly. "Due to the world's environmental regulations, the push towards electric and hybrid automobiles is proceeding at a steady momentum. The performance level required for lithium ion batteries is very high," Zettsu said. "Currently, we are working on manufacturing real battery cells for plug-in hybrid vehicles and battery electric vehicles using the coating process and experiments in automatic driving modes." This work was supported by Japan Science and Technology Agency and the Japan Society for the Promotion of Science. Other contributors include Dae-Wook Kim, Shuhei Uchida, Hiromasa Shiiba, and Katsuya Teshima, all of whom are affiliated with the Department of Materials Chemistry at Shinshu University. Teshima is the director of the Center for Energy & Environmental Science at Shinshu University.